Can you believe there are only 5 more teaching days until Winter Break? Well, for me, at least! And boy do I need it! Thanksgiving break was a bit chaotic for my family. I had to drive us from central Texas back to Colorado through an ice storm because my husband was terribly sick. (We found out later that he actually had pneumonia!) We made it through the rough weather only to hit a huge deer in New Mexico. After we sorted through that mess, we ended up stranded about 160 miles from home due to an interstate closure because of weather. Unfortunately, we realized too late that our hotel didn't have hot water. Sigh. I was so relieved to get home. But then the 3-year old got sick, 3 of the 4 toilets in our house broke...well, you get the picture! I need another break! But I wanted to pop in and share a book that I love read to my class and my own kids every year as we approach Christmas. Can't Wait Till Christmas! 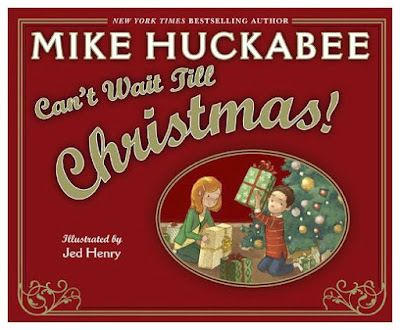 was written by Governor Mike Huckabee and was released back in 2010. You can check it out on Amazon by clicking HERE. Now...I'm a big Mike Huckabee fan, and I admit that I bought the book mainly because of that. (And I'm a big sucker for Christmas books!) But it has turned into one of my favorite books to read during the Christmas season. I love the book's overall message, which is the benefit of patience. It also focuses on honesty, the kids' feelings, and the consequences of their actions. You could definitely use it for cause and effect. It's an awesome book for the home and classroom. If you have the chance to read it, you definitely should! Here's to a quick week in the classroom!